Hey all, here's my lame apology for not being up on things. While there's a lot going on, there's been little "free" (ha!) time to write. 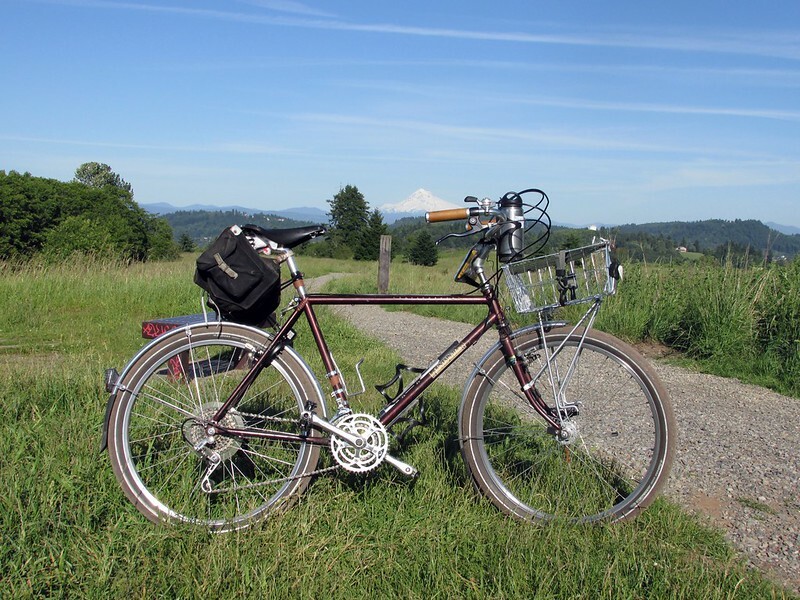 And we're a week into Pedalpalooza! While I haven't gone to a lot of rides (only two), I have already led/co-led two, will be leading one this very morn (the Columbia Gorge Ride) and still have three more to lead/co-lead. So I have been hecka busy with bike stuff, and as soon as I get a chance to breathe again I will be writing things like ride reports on the Country Bike Ramble and such. But something quick to share with you, and it's a tale of bike woe. 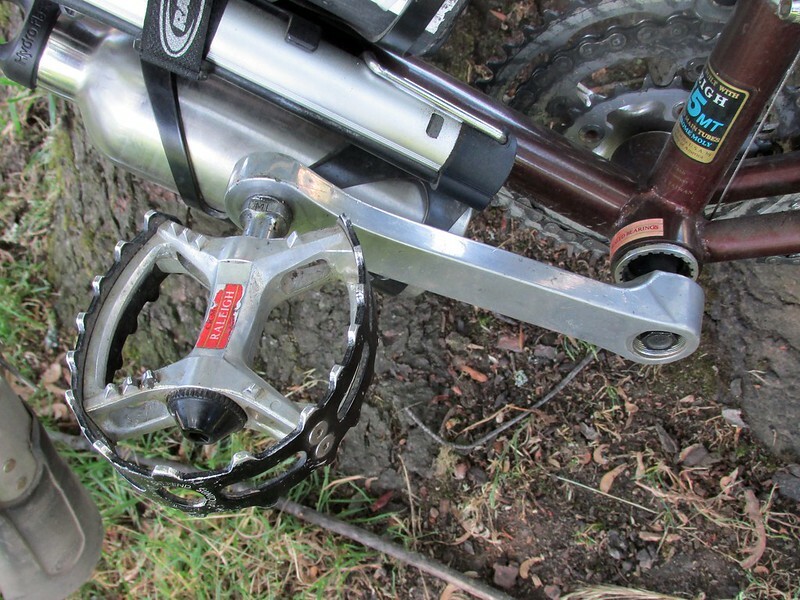 We all have heard by now about my amazing ability to snap even steel cottered cranks. (The crank has been replaced, thank you.) But this wasn't the end of crank issues for me. On Sunday I led the Country Bike Ramble. I pulled out the most appropriate bike for the task, which was the Raleigh Crested Butte. I'll be talking about the Ramble soon, but the short story is one mile in I felt some looseness from the left pedal (so I thought). When I stopped I realized that no, the whole left crank was loose. Luckily we found a local that had a ratcheting wrench set, so I tightened it up and off I went. Then another ten miles and the crank was loose yet again. Urgh. So the ride ended a bit short and I high-tailed it over to Oregon Bike Shop to get a new-to-me crank while the crew "decompressed" with beer at Roscoes. The new crank isn't an exact match, but it works. But wait! That's not all! On Wednesday I had to ride over to deepest SW for a dentist appointment. I took the Bridgestone XO-3 as I wanted to test it before riding it on the Columbia Gorge Ride today. I just did a bunch of stuff to it (yes, yes, more on that later) and was psyched about testing it on a longish ride to the Gorge. Riding there I felt some play in the pedals yet again. This time I really thought it was around the pedals as the Power Grips tend to get loose after time. But the play apparently is around the bottom bracket, as both cranks are loose. Not majorly loose, though, but still loose. I contemplated just taking the XO-3 for the Columbia Gorge Ride as it didn't seem to bad, but then again I don't want the bottom bracket and/or cranks to self-destruct out there, miles from any transit options. So I'll play it safe and take Ye Olde Long Haul Trucker and get the XO-3 looked at when I get back. Three crank issues in less than a month? Egads. You can just call me "crank breaker". That is part of their job description: Be the reliable fall back to, always there for my guy, bike!